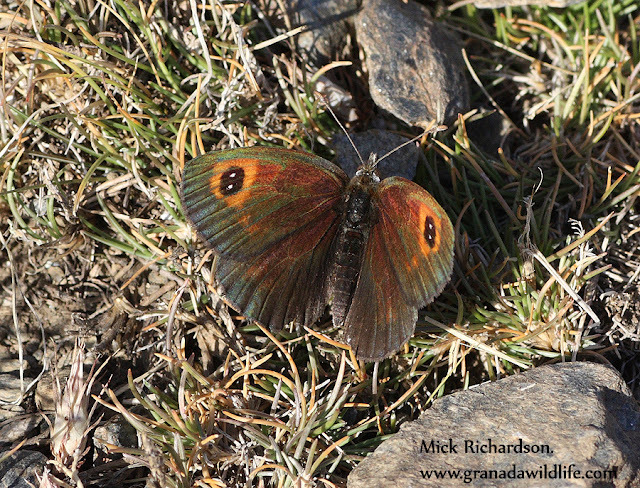 Another go at the Ringlets then a minibus to 3100m and a walk back down to the car. Paul and Helen Brock Day Four. 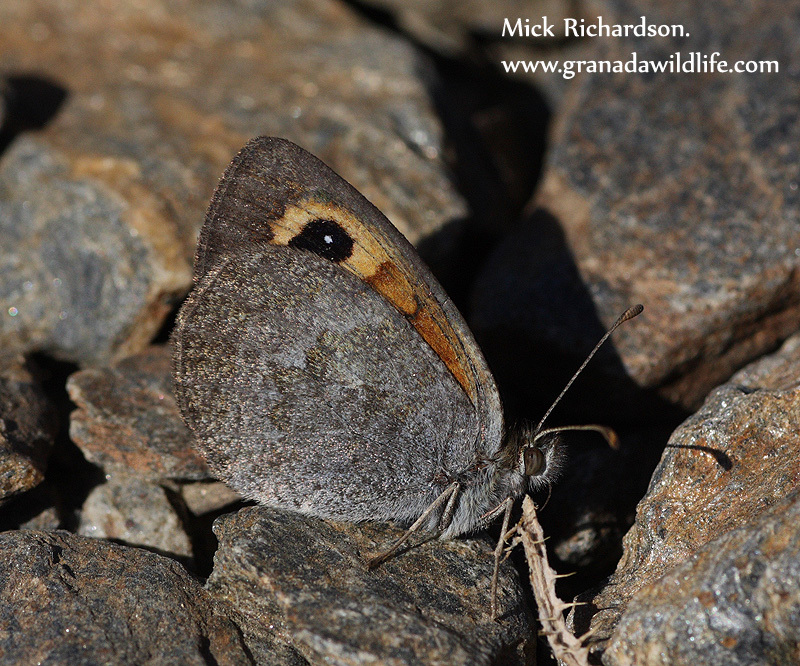 We started out by parking near the barrier above the ski resort and walking to the area where we had seen some very active Spanish Brassy Ringlet (Erebia hispania) a couple of days ago hoping that being there quite early might make them a bit more approachable. Almost straight away we found several insects on the wing but they were as hoped for far less active and allowed us to get to with in camera range a lot easier than before. 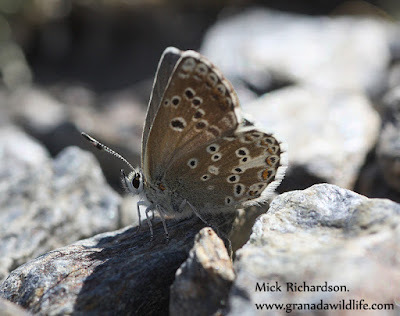 In the same area we saw Apollo's (Apolo / Parnassius apollo subsp nevadensis), Nevada Blue's (Niña de Sierra Nevada / Plebicula golgus subsp golgus), Black Satyr (Negra / Satyrus actaea), a very tatty Niobe Fritillary (Argynnis niobe), Rock Sparrow (Gorrión Chillón / Petronia petronia), Northern Wheatear (Collalba Gris / Oenanthe oenanthe), Rufous-tailed Rock Thrush (Roquero Roja / Monticola saxatilis), Tawny Pipit (Bisbita campestre / Anthus campestris), Linnet (Pardillo Común / Carduelis cannabina), Pallid Swift (Vencejo Pálido /Apus pallidus), House Martin (Avión Común / Delichon urbica) and Sparrowhawk (Gavilán Común / Accipiter nisus). Wild flowers included Nevada House Leek (Sempervivum minutum), Foxglove (Digitalis purpurea), Erigeron frigidus, Spanish Mountain Thistle (Ptilostemon hispanicus) and Eryngium glaciale. Once back at the car park we made our way to the nearby hotel where we got on to a minibus and were taken up to the 3100m point from where we made our way back down the hill to the car on various tracks and the road. 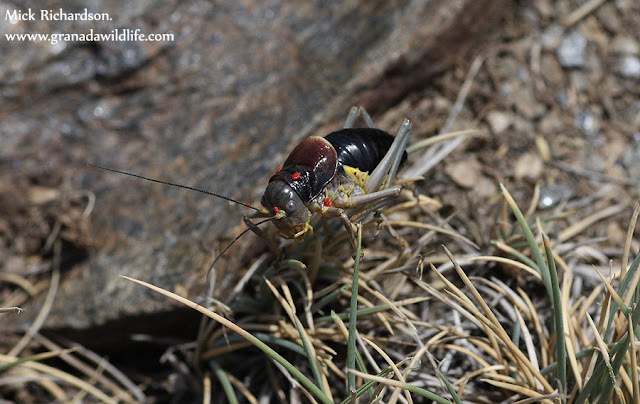 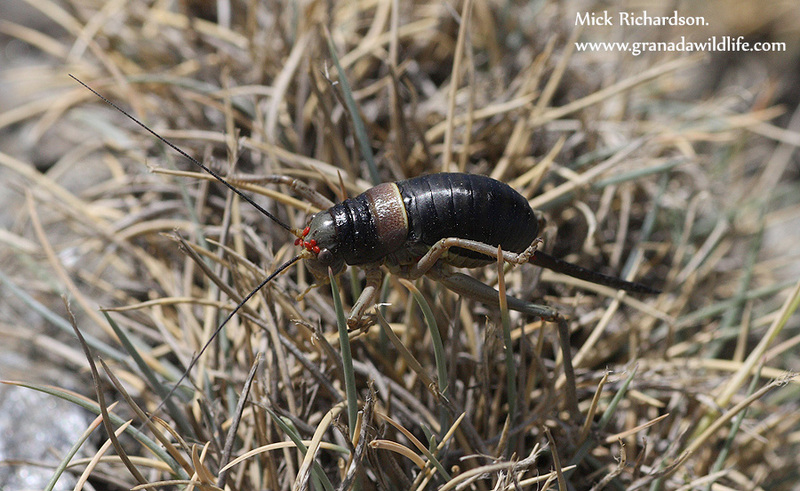 On the way we found both male and female Baetica ustulata, an endemic Bush Cricket species which was another of the top target species Paul had wanted to see and both sexes performed well for the camera's. As we dropped down we also recorded Small Tortoiseshell (Aglais urticae), Silver-spotted Skipper (Hesperia comma), the Sierra Nevada subspecies of Spanish Argus (Aricia morronensis ssp. 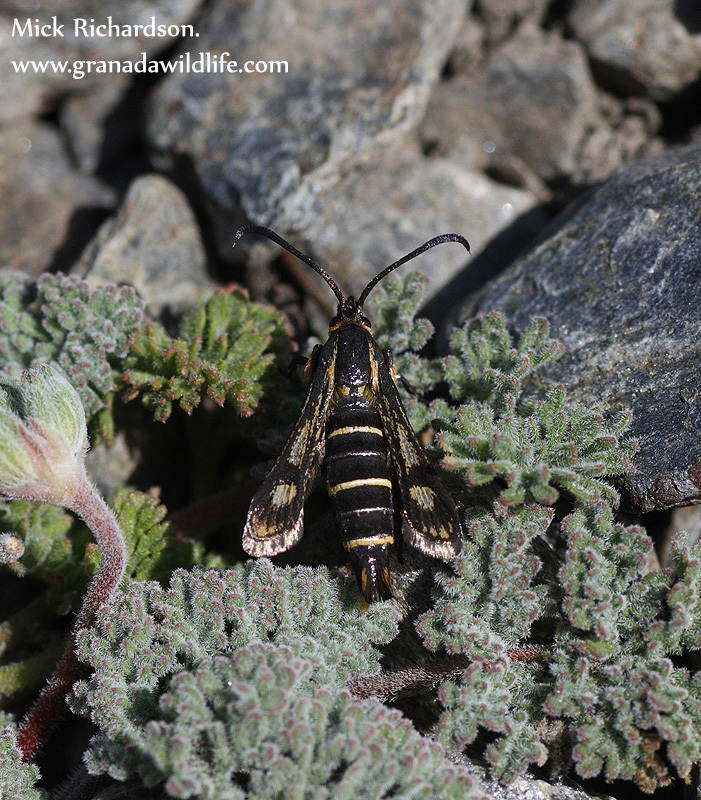 ramburi) which was found amongst it's food plant Erodium cheilanthifolium, more Nevada Blue's and Apollo's, a Purple Hairstreak (Quercusia Quercus) at 2700m well above the tree line, Six-belted Clearwing (Bembecia ichneumoniformis), Carpentor Bee (Xylocopa violacea), Blue-winged Grasshopper (Oedipoda caerulescens), Mountain Stone Grasshopper (Eumigus monticola), Raven (Cuervo / Corvus corax), a Griffon Vulture (Bultre Leonado / Gyps fulvus) and a great many other insect species most of which I still need names for. 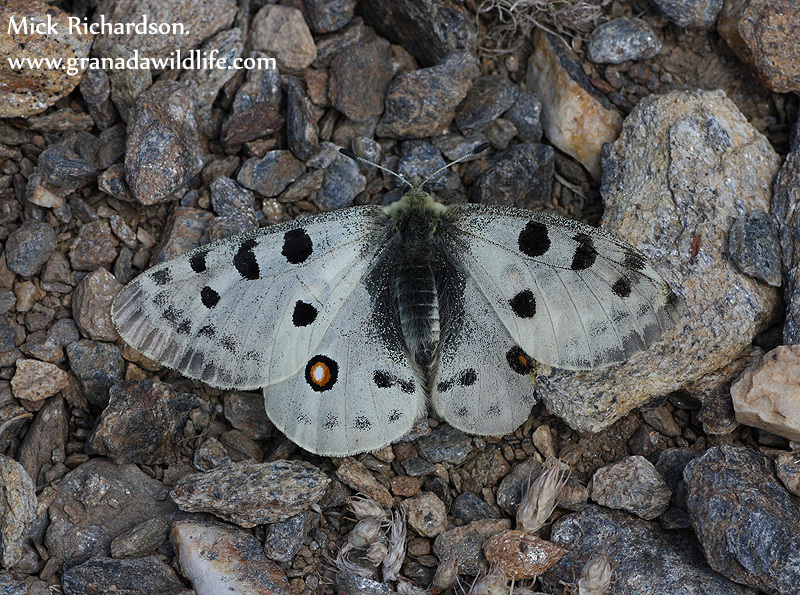 Photographs from the top: Spanish Brassy Ringlet (Erebia hispania) upper-wing, Spanish Brassy Ringlet under-wing, Apollo (Apolo / Parnassius apollo subsp nevadensis), female Baetica ustulata, male Baetica ustulata, Spanish Argus (Aricia morronensis ssp. 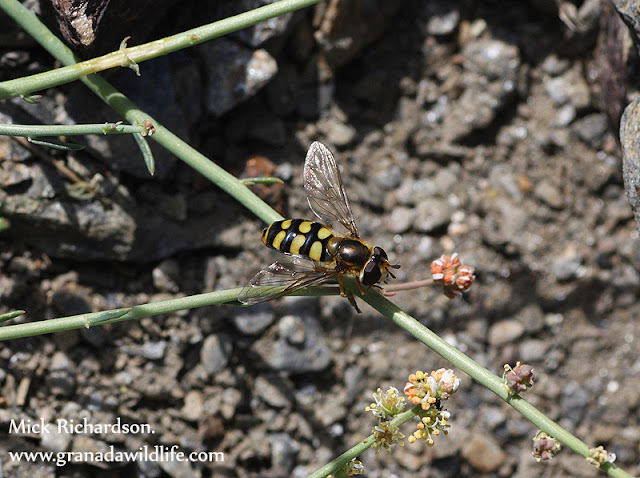 ramburi), Six-belted Clearwing (Bembecia ichneumoniformis) and Hoverfly Species.